Become a Member. Gain Expertise. Use this Site fully to your Hakka Mantis advantage. If you don’t see the answer here, then use the Contact form below and send us your question. 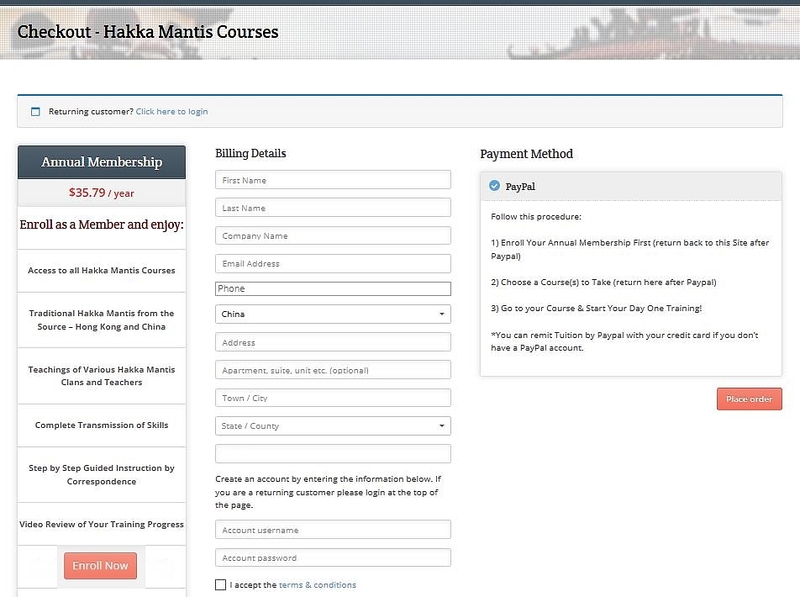 Click the ‘Enroll Now’ button and join our Hakka Mantis Boxing International Community. Your annual Membership will grant you access to all current and future Courses and allow you to create projects and discussions, learn with other students, and interact with teachers. Enroll now. After completing your Paypal Membership fee, you will be redirected to our Site where all Courses will be available to you. For the best understanding and ability follow the Courses in order and step by step. Make sure to immediately complete your Profile and use your full and proper name so that your Certificates will be correct. Do this before taking any Course. Each Course has the training outlined DAY BY DAY until completion. Follow step by step, day by day. Skipping any part will result in a lesser understanding and ability. All Browsers are not equal. Switch now to Google Chrome full screen mode for the best viewing experience. Your Username will be important in login and ordering. It may also be displayed in comments, posts, etc. Give some consideration to your on-screen Username and make it appropriate for you. Using your proper and full name is suggested. These two are used to sign-in to your Profile. See the Profile explained here. Enroll each year and keep your Certificate of Membership active (and access to all Courses). When you Enroll your Certificate of Membership will become available for download. A Certificate of Completion will be available for all Courses that you complete successfully. Use your Membership in the Hakka Mantis Boxing International community to contribute to projects, discussions, learn with other students, and communicate with teachers. And to gain an expert understanding and ability in Hakka Mantis Boxing. Does my Annual Membership auto renew? No. Your Membership will not auto renew. Once a year, you may renew your Membership and receive your updated Certificate of Membership. Keeping your Membership active allows you continued access to all Courses and you may continue training step by step, to completion, the USA Kwongsai, China Kwongsai, and Chu Gar Mantis transmissions. A computer, tablet, or smartphone with an internet connection is all that is needed. All instruction and training is online. You don’t need special software to install, run, or download. Just Sign-In, go to your Courses, review or continue training. Access to your Courses never expires, as long as your Annual Membership is active. If your Membership expires, just Enroll again you will have access to all the Courses you have taken. Available on-demand, you can learn at your own pace, your own time, and on any device. Your online Library of complete Hakka Mantis transmissions is available 24 hours a day, 7 days a week, 365 days of the year. Make sure to keep your PC and mobile hardware and software updated to avoid conflict with the Site and Courses. Can I use more than one computer or device? You can access your Membership and Course Training on as many computers and devices as you like. However, note that our system audits your account and your IP. Your Membership is private. Protect and value it. Exercise your martial art integrity just as you would in a regular Hakka Mantis School to secure your Online Courses. Do not share your login details or access to your Profile or Account on this Site. This will result in the system’s automatic termination of your Membership and cancellation of your Course activities, without notice, and they cannot be reinstated. It is strongly suggested you complete one Course before beginning another. Course lengths vary according to the skill taught. This is primarily a matter of your time and effort. If you have sufficient time and strength, you may train more than one Course at the same time. However, in all cases, we suggest you follow the Courses as outlined on the Suggested Training page. This shows the training step by step from basic to advanced. New courses will be added until all three Hakka Mantis Transmissions are complete and available for your Online Instruction. We will send you an email notice when new Courses are released. How do I order more than one Course at a time? Go to the top menu, “My Account”, “eStore”, and you can add multiple Courses to your Cart and order once. However, it is difficult to train more than one Course daily. Each Course has daily Lessons. At the top of each day’s Lesson is the “Mark Complete” button. When you finish that day’s training click the “Mark Complete” button to update your Progress bar for the Course. Use the arrows to move forward or back through the Course Lessons. Use the X to click out of the current Lesson and back to the Course page. If you have clicked “Mark Complete” and progressed to the next Lesson, you can still go back to previous Lessons and “Mark Incomplete”. In this way, you can go back to spend more training time on previous lessons. Just don’t forget to “Mark Complete” each Lesson when you are satisfied with that Lesson’s progress. What am I going to get from the Courses? There are three transmissions of Hakka Mantis Boxing here: (Lam Sang’s) USA Kwongsai Mantis, China Kwongsai Mantis, and Chu Gar Mantis. Courses are designed step by step and should be trained Online exactly as you would in a regular Hakka Mantis School. Each Course contains several days or weeks of training that is delivered Day by Day until you complete the skill. Just follow the instructions for each day and at the end of the Course you will have gained an understanding and ability. Students or teachers will gain the information and skills needed to become a top Hakka Mantis boxer, improve your health, and preserve and promote traditional Hakka Mantis culture. We’ll issue a 100% refund within 7 days of starting a Course. However, this is Hakka Mantis martial art. Know what you are doing – be clear and be sure before starting any Course. If you have a question or are unsure, then contact us before you take a Course. Time is the deciding factor in your understanding and ability. Most Courses require several consecutive days or weeks of instruction. Single man forms require 30 consecutive days of training without fail to gain skill and ingrain muscle memory. Just follow each Course as outlined, day by day, step by step, and you will gain an understanding and ability. Is my personal information sold? No. We do not sell or share any personal information. Your Profile and Course information is safe and secure on this Site. If you cannot remember what email address you used to subscribe, or if you no longer have access to that email address, please contact us directly using the Contact form below. When you subscribe, you receive an activation email that contains your username and password. Save this email, print it out, and write it down in your password book. 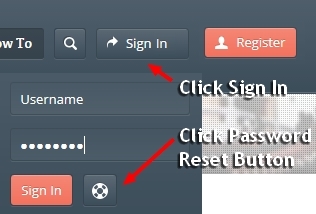 However, you can always reset your password or ask for assistance with your email address. Google Chrome and Mozilla Firefox full screen video is available. Windows IE (Internet Explorer) browser does not support full screen video. IE users can press F11 to go full screen. Video quality depends on the age of the original footage. Our archive includes footage from the 1950s onward which was originally 16mm, 8mm and so on. All footage has been converted to SD or HD size for Online Courses. What is the difference between Subscribe & Register? Anyone can subscribe to our mailing list for Hakka Mantis news and updates. However, Subscribers are not Members and therefore must Enroll to gain access to Online Courses. Enrolled Members are automatically registered and subscribed and have access to all Online Courses. Both Subscribers and Members will receive our newsletter occasionally and notifications when new Courses are released. How do I get technical and billing support? If you don’t see your answer here, send an email using the Contact Form below and you will receive a response within 48 hours (usually within 24 hours). Remember we are in beautiful, sunny, south China! Make it a point to come here and train with us. I've paid my Membership and tuition for a course but when I go to the Site, I cannot access the Lessons. The message states, "Enroll to View this Content". You must be signed in to access your account. Sign-In at the top of the home page. Then go to your Course and lessons. Too Many COURSES - Where do I start? Most people will be confined to learning one Branch, from one Clan, of Hakka Mantis, in their own local area, if lucky. That is why the ONLINE COURSES may seem to have so many Skill Sets – it is HAKKA MANTIS – THREE BRANCHES – And MANY CLANS! The ONLINE COURSES are HAKKA MANTIS – ONE ROOT – THREE BRANCHES – and a much broader than usual overview! “3 useful skills are better than 10 just for show” – but, to gain one’s best ability, one shouldn’t limit his understanding. You must study and train all the COURSES (Fundamentals – Advanced – Books), as they are available, to gain a broad understanding and the big picture. After you have trained all the COURSES, you can go back and concentrate / specialize on which skills suit you best, or suit your need. You cannot have a full understanding of Hakka Mantis, until you have gained an understanding and ability, of the Hakka Mantis Three Branches – One Root. DO NOT RENEW YOUR MEMBERSHIP BEFORE IT EXPIRES! HMBI does not auto-renew Memberships. Let your Membership expire. And ONLY THEN simply ENROLL your active MEMBERSHIP again for another year. On the top of your PROFILE page, you can view how many days remaining, on your Annual Membership. WAIT until your Membership expires, before ENROLLING again.